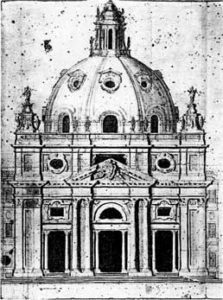 By the 19th century the church of Sant’Agnese in Agone was showing its age. Among other problems, the rich wall marbles and gilding were blackened and the floors were fragmenting. Between 1852 and 1853 the interior received a much-need refreshing. It was at this time that the eight large iron-framed windows were installed, to plans prepared by Andrea Busiri Vici.